This text tells the evolutionary story of the cichlids, small perch-like fishes, geographically isolated in Lake Victoria long enough to undergo unusually broad speciation. It looks at the events leading to their near extinction and discusses the history of Lake Victoria's ecosys... read full description below. Dazzling in their variety of sizes, shapes and colours, the cichlids (small perch-like fishes) of Lake Victoria, like the finches of the Galapagos Islands and Hawaii's Honeycreepers, have been geographically isolated long enough to undergo unusually broad speciation. These small fish form a species flock - closely related species that have descended from a common ancestor and radiated, or fanned, into different specializations - that is one of the most spectacular in the world, interesting anatomists, ecologists, ethologists and evolutionary biologists alike. The process of speciation was still under way until just recently, when the introduction of the large, predatory Nile perch so disrupted the Lake's intricate ecosystem that the glorious spectrum of cichlids has almost vanished. 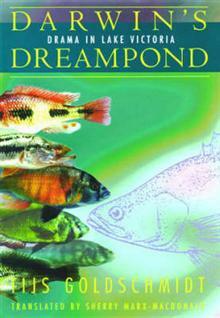 Darwin's Dreampond tells the evolutionary story of the extraordinary furu and the battlefield leading to extinction. Tijs Goldschmidt skilfully blends a discussion of the principles of neo-Darwinian evolution and speciation with a history of Lake Victoria's ecosystem. The science unfolds in the context of the first-person narrative on Golschmidt's adventures and misadventures as a field researcher. He portrays the colours and textures of the landscapes and the lives of the local people as he interacts with them during the course of his fieldwork.